The New York Times reports that Apple has knocked off Coca-Cola (Sugar water!) to become the ‘World’s Most Valuable Brand’ according to the annual Interbrand Best Global Brands Report. The 2013 report begins: “Every so often, a company changes our lives, not just with its products, but with its ethos. This is why, following Coca-Cola’s 13-year run at the top of Best Global Brands, Interbrand has a new No. 1 — Apple.” The report estimates the value of the Apple brand at $98.3 billion, up 28 percent from the 2012 report. Apple’s rivals Google and Samsung also moved up in the list with Mountain View also hopping over Coca-Cola to #2 at a $93.3B (up 34%) valuation while Samsung entered the top 10 with a new brand strategy called the Brand Ideal, which includes “a greater focus on social purpose”. Microsoft, who just lost a CEO, was flat. Perhaps a sign of the times, Apple—a company that has changed our lives, not just with its products but also with its ethos—has risen to the top of our Best Global Brands list, giving us a new number one for the first time in 14 years. As legions of fans can attest, few brands have enabled so many people to do so much so easily. With a reputation for revolutionizing the way we work, play and communicate, Apple has set a high bar for aesthetics, simplicity, and ease of use that all other brands are now expected to match. Apple’s ability to “think different” and deeply consider the customer experience is what makes the brand a leader—one that has inspired a loyal following and has the whole world anticipating its next big move. Brands, as Apple exemplifies so well, are business strategy brought to life. Technology brands in top 100 (#4 IBM is no longer Technology but business services). As per Mark’s scoop last week, Staples has indeed begun selling the iPad and is offering the full line with 5% back in Staples gift cards. 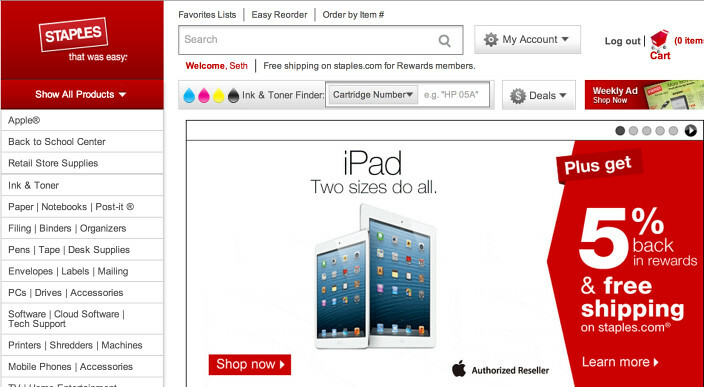 Staples now also carries every iPod model including the iPod touch, Classic, Nano and shuffle. You can now order the iPad from its online stores (which will begin shipping next week), and if online sales go well, through its physical retail stores early next year. Staples will also begin putting up iPad kiosks in its stores next week. You’ll recall from our iPad Product Page, we’d probably recommend holding off the purchase of any iPad because Apple will likely update its line in October. However, those companies with Staples purchasing accounts will now be able to scoop up an iPad on the corporate account. Staples began carrying Apple products in the US earlier this year and would seem to be doing well at it as evidenced by the expanding line of products.